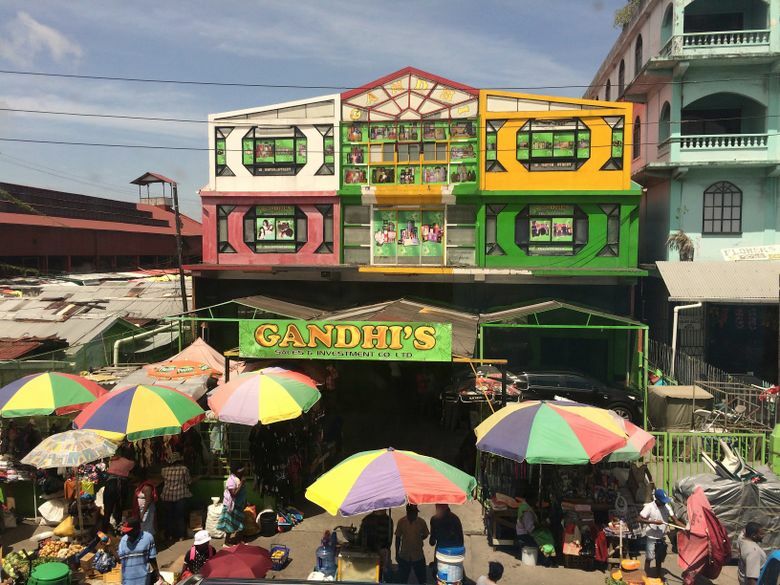 GEORGETOWN, Guyana — From 6,000 feet above Guyana’s rain forest, the jungle canopy below spread to the horizon in every direction, like wall-to-wall green carpeting. Winding, mud-brown tributaries of the Demerara River shimmered in the sunlight. My endless view of the jungle and the aggressive hum of the plane’s propellers eventually drowned out the grittiness I’d experienced in the capital, Georgetown. Headed for Kaiteur Falls, I began to relax, for the first time in three days. I’d come to this South American nation to see where my father-in-law grew up, and my husband prepared me for conditions I wasn’t exactly used to. The gargantuan bugs, he warned, were as ubiquitous as the abject poverty. I went into the trip with an open mind but slathered myself with insect repellent so strong that it actually rubbed varnish off wooden furniture. 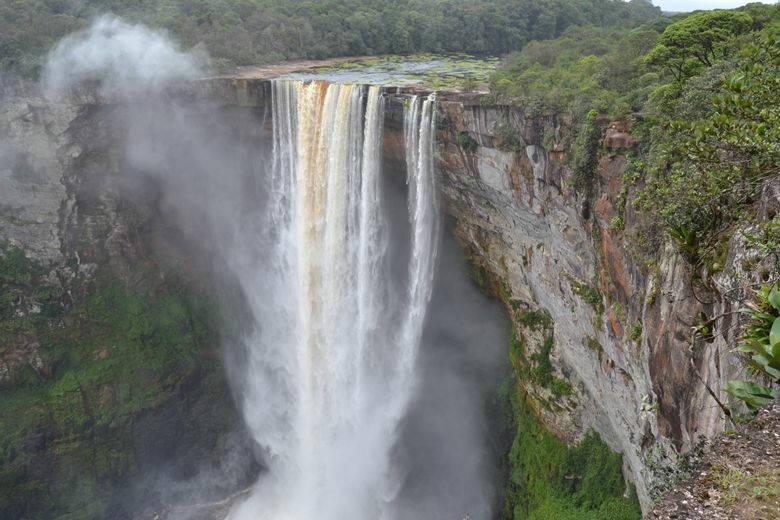 Day trips from Georgetown to Guyana’s Kaiteur Falls by Roraima Airways cost $180 per person. Several companies do tours. Trips are subject to minimum passenger counts and weather; roraimaairways.com. • Beware that Guyana is listed among the countries that fall within the zone for mosquito-borne transmission of the Zika virus. I couldn’t wait for our excursion to the country’s interior. The plane took off from a small airfield near Georgetown, hooked a left for an aerial view of the low-rise capital, and veered south over the vast expanse of green. About 90 minutes later, we bounced onto an airstrip with the buzz from a brief, disconcerting alarm and came to a stop about 200 yards from the cliff that produces one of the world’s largest waterfalls. A guide told our group of about a dozen that the Potaro River drops a staggering 741 feet — more than 100 feet greater than the height of Seattle’s Space Needle. The waterfall gets its name from Kai, a Patamona chief who according to legend paddled his canoe over it in self-sacrifice to appease Makonaima, the Great Spirit, and protect his tribe from raiding rivals. As the guide led us through lush vegetation, he helped us search for tiny golden frogs, small as yellow M&Ms, that live their entire lives in pools in the leaves of giant bromeliads, a relative of the pineapple that grows 15 feet tall. He pointed to other highlights: a rubber tree with a fruit resembling a red onion; a vine you can slice and drink water from; a sticky scarlet moss that traps insects, one of six carnivorous plants in the park. Closer to the falls, the distant “shhhhhh” of crashing water rose to a low rumble. I clambered over and under gigantic boulders and up to an overlook, taking in my first view of the cascade free-falling into the verdant canyon. I ignored signs to stay at least 8 feet from the edge, getting low to peer into the straight drop dozens of stories below as low passing clouds blended with the rising mist. Over the next couple of hours, we hiked trails around the waterfall and scaled up to two more lookout points for closer, even more stunning views. Standing at the third, I realized this was the most isolated place I’d ever been. The falls are at least a three-day trek from the nearest road. 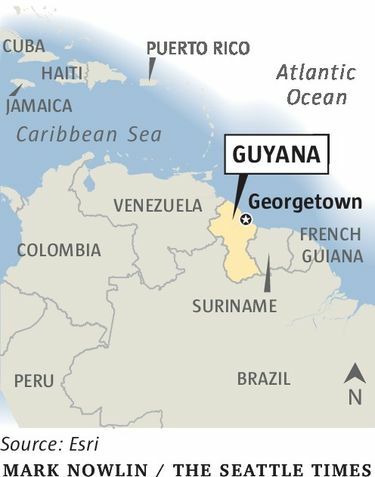 Rejuvenated, I returned to Georgetown for another few days with newfound appreciation for Guyana. I soon learned there’s hope in the capital since a new government took power last year, with efforts to clean up both the corruption and litter that have deterred tourists. Already, my in-laws said, the capital was cleaner than they remembered. Meanwhile, all those taxi rides were cheap, averaging about $2 U.S. per trip, and we traversed the city in search of hidden delights. I sopped up probably a dozen versions of curry with roti, the Indian flatbread, including one made from labba, an herbivorous jungle rodent the size of a lamb. And cook-up rice that was on nearly every menu — a varying one-pot dish with black-eyed peas and coconut milk — reminded me this former British colony shares more in common with the Caribbean than its Latin neighbors to the south. By the end, I was weaving through crowds at the main Stabroek Market with the confidence of a local. More comfortable now, I chatted with vendors about the cornucopia of exotic fruits, settling on a fragrant bag of red bananas. On our last night in town, a cousin of my husband’s took us to a bar, Seeta’s. It was the only place I saw that was packed after dark. We knocked back a few bottles of Banks beer, mixed in with the crowd and met plenty of warm, inviting people, and I finally saw the other side of this evolving destination.